Discover our range of shredders to meet your business needs, built to international security standards. Which shredder is right for me? Take a look at our product comparison to find the device that's right for your business. Discover the international security standards for shredding and disposal of secure documents. intimus International Group is an international company headquartered in Markdorf, Lake of Constance, Germany, with regional offices in 10 countries around the world. Founded in 1956 as Schleicher, the intimus brand was born in 1965 with the introduction of the intimus Simplex, our first office shredder. intimus has never stopped innovating in the years since then, revolutionizing the data security market with the invention of cross-cut paper shredding technology in 1985, the first industrial and media shredding solutions in 1990, the introduction of revolutionary cash deposit systems in 2014 that changed the way the retail and gaming sectors securely manage cash, and the launch of the FlashEx in 2016, the first system to safely move the destruction of electronic media out of industrial disposal centers and into an office environment. 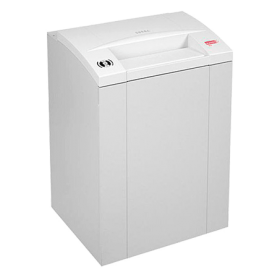 Intimus 120 CC3 Cross Cut Paper Shredder is a document shredder for large organizations that need a comprehensive data disposal solution. The Intimus 120CC is built with consumer demands in mind and equipped with the best technologies and high quality components. 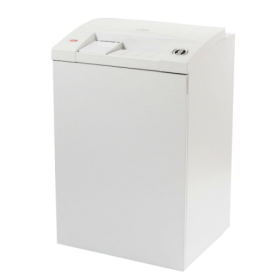 Intimus 120CC solution is specially designed to cater to the needs of users who need a single shredder for whole departments. It is powerful enough to handle the demands of several people at a time and thus is the ideal document shredder for departmental applicationsIntimus 120 CC3 Cross Cut Paper Shredder is a document shredder for large organizations that need a comprehensive data disposal solution. The Intimus 120CC is built with consumer demands in mind and equipped with the best technologies and high quality components. 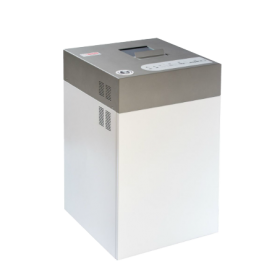 The intimus 130 CP4 office shredder is the workhorse of many commercial and governmental offices, a tough machine that stands up to constant, daily use. The 130 CP4 shreds 17 to 22 sheets per pass at up to 622 sheets per minute. The 130 CP4 complies with P-4 security standards, producing shreds measuring only 0.22 square inches (1.41 cm square). No need to waste time removing staples and paperclips, as the CP4 handles these with ease. A light sensor detects when paper is inserted and activates the shredding mechanism, illuminates the feed slot with a yellow light when it is necessary to reduce the number of sheets being inserted at a time, and shows a red light when the unit is overloaded and engaging the auto-reverse mechanism to prevent damage to the cutting heads. i-control control panel presents indicator lights in a readily accessible manner, alongside the forward, reverse, and power buttons. 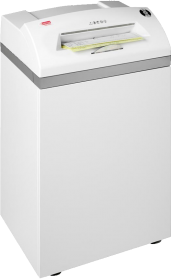 The 130 CP4 is equipped with an oversized 34.3 gallon (130 litre) catch basket that can hold nearly 3,000 shredded documents. The intimus 175 CP5 is a shredding solution designed for offices in need of thorough paper media destruction. Professional Data Shredders – a Synthesis of Technology, Performance and Design. 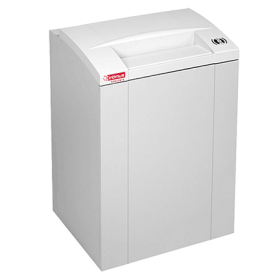 All intimus® shredders are built from durable, precision engineered, high-performance components, designed for a long life of high volume usage. The product range covers all requirements from day-to-day office use up to High Security Shredding machines in use for destruction of classified material in line with all current legal requirements such as DIN 66399 or NSA 02/01. intimus® shredders carry various features which make them unique in user-friendliness and operating efficiency. For organizations which need to shred CDs, DVDs and paper at the highest security level, the intimus 175 Hybrid is our first shredder which combines both functions in one machine. The intimus 175 hybrid meets the requirements from international security authorizations as the US NSA or the German BSI. This machine meets the requirements of the highest security level of DIN standard 66399. For optimum performance our machine comes with a new automatic oiling system ensuring trouble free operation. Special attention was taken to ensure environmental friendly design. This dual function shredder with i-control is equipped with the Ecologic energy management system, as a standard feature. Ecologic time responsive electronics puts the shredder into sleep mode after its been at idle for some time. Waste separation follows the sustainable approach. The separation of optical media waste provides the best conditions for recycling. The Intimus 852CC is a Hopper Fed, Cross Cut Departmental Shredder designed for the bulk destruction of secure waste, ideally suited to be sited on every floor of office blocks. Perfect for shredding crumpled paper, with paddles to push waste through the machine. Requires 3-phase power. The FlashEx is a “plug and play“ flash media shredder and can be used anywhere in the workplace. The FlashEx has a specially designed solid cutting head which grabs the material with specially designed claw like cutting cylinders pulling material into the unit. It automatically reverses itself on thicker material until the item is totally destroyed to 4x15m end waste particle.